I’m a Yorkshire lad so when I was there I had to have Yorkshire puds. I love this dish for its simple flavours. Fresh beetroot taken straight from the ground tastes so much better than any flown halfway round the world. Put the flour into a large bowl and season well. Mix then make a well in the middle. Stir in the eggs, one at a time, then slowly pour in the milk, continuously whisking until the batter is smooth. Chill for 30 minutes or for up to one day. When you are ready to cook, preheat the oven to 220°C/fan 200°C/gas 7. Put the beetroot in a pan and cover with cold water. Pop a lid on the pan and bring to the boil then reduce to a simmer for 40 minutes, until tender. Lift the beetroot out of the pan and set aside. Once cool, wrap them in kitchen paper and rub to remove the skins. Beetroot juice can stain your hands for days after you touch it, so you may want to don a pair of rubber gloves while you’re preparing them in this recipe to try to avoid this happening to you. Cut each beetroot into quarters, trimming away the stalks. To bake the Yorkshires, spoon 1tsp of dripping into each of the holes in a 12-hole muffin tin, then heat in the oven for 5 minutes, until the dripping is hot. Carefully ladle the batter into each hole then bake for 30 minutes, until the Yorkshires are well risen and browned. Keep warm. To cook the beef, melt the butter in a frying pan over a medium heat and brown the beef all over. Season then brush the treacle all over it and press chopped herbs onto the beef. 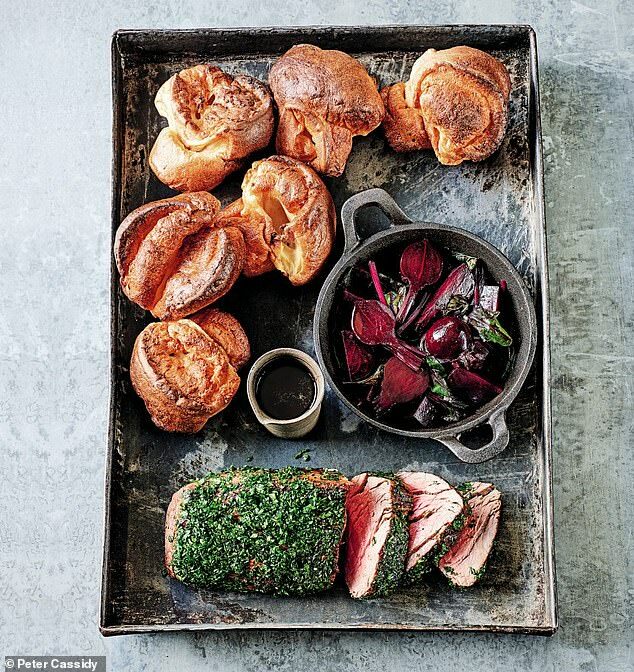 Transfer to a roasting tin, add the beetroot and roast for 20 minutes for medium-rare. Meanwhile, pour the wine and jus into a pan and bring to the boil. Simmer until reduced by half, then pour into a serving jug. Take the beef out of the oven and leave to rest for 10 minutes before slicing and serving with the Yorkshires, beetroot and the sauce.